In today’s world, our pursuit of a life well lived gets squeezed out by the silliest of things: binging on Netflix or ice cream, shopping trips for things we don’t need, bad habits we can’t seem to get a handle on and so much more. Valerie has been there despite knowing what she wanted for her life. Actually do it though? That’s the real challenge. I got this book and had no idea what to expect. I love the cover and the back cover copy intrigued me. I'll be honest, I haven't finished this book yet. Why? Because it's so good! I have been taking it slow, letting her ideas sink in, and making it to where I do actually apply what I am reading. This book has some great insight and I like how Valerie uses a lot of the Bible as a resource. There is a website where you can download the worksheets that she mentions in the book for free. They are a great companion. Simple things you have to think about like goals, and what your distractions are that take away from God are what this book is about. Writing these things down in an organized way is actually quite helpful. While reading this book I am certain that Valerie and I could sit for coffee and talk for hours as if knowing each other for years. Her thoughts and ideas are so very similar to my mind which is why I like this book so much. I feel like she is someone who gets it and decided to go for it. This pretty much sums up the book and she actually has great ideas on how to change this in our lives. Valerie Woerner is owner of Val Marie Paper. She and her husband, Tyler, live in Louisiana with their daughter, Vivi Mae. 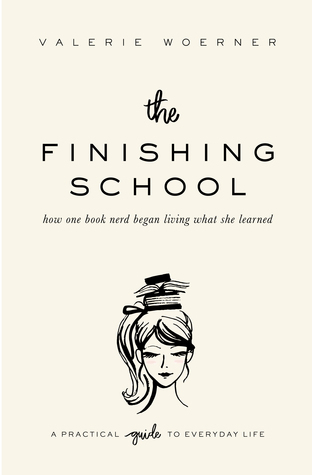 The Finishing School is her first book.